Prepare all the content you need. It will be prepared right now - with fresh up to date information! Download your free Costa Rica Travel Guide. Not many years ago we all were used to travel with printed travel guides - from Lonely Planet, Frommer's, Rough Guides, Fodor's and others. The books were usually great and they were helping us to find the best places to see, to eat at or to stay in... But now it is the time of electronic books and the choices are wider: You may have not only a guide from the big brands, but a guide from independent sources as well. And this is where we can help you. 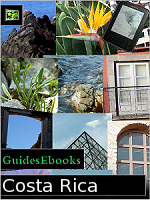 The guide is then suitable for e-book readers, tablets and smartphones with Android, iOS, Windows etc. There is a great website named WikiVoyage, where hundreds of people write information about many places of the world. You can find all the places of Costa Rica manually there and then start the right tools to create a book using them - or you can use GuidesEbooks which will do it for you. You just need to press the three buttons below and we will open WikiVoyage website, insert all the places of Costa Rica to the right tool and you then just have to choose the right format of the book and press Download. And the free Costa Rica travel guide will be yours. Use it in your e-book reader, tablet or smartphone with Android, iOS or Windows. If you need more detailed information, just look below - we have prepared some useful tips for your travel there. Second step: Press the second button - it will open a WikiVoyage page in the new window and add all the content for the Costa Rica Guidebook. Be patient, please! It will take some time! Then it will close the page and you can continue with the third step. Third step: Press the third button - it will open a WikiVoyage page in the new window and you will see all the content there and the button for download. On the right side of the page choose the right format (pdf, epub etc.) and press Download. The Costa Rica Travel Guide will download. Then close the WikiVoyage page. If you need another format than is available for download (eg. mobi) then read our tips below. You may reorder the content and add chapters before the download - just see the list of places on the left side of the WikiVoyage page. Free Costa Rica Guide - ebook in another format: If you need the Travel Guide in another format, for example mobi or prc, convert it from epub using an appropriate software, eg. Calibre, which is free. You will find the link to Calibre on our Best Travel Tools page. Use a suitable app to read the guide not only in your e-book reader, but in your smartphone or tablet with Android, iOS or Windows as well. Travel book with guaranteed content: As we have written above, the free Costa Rica Guide on this page is created on WikiVoyage page from information inserted by many travellers. If you prefer a guide from a professional publisher, then you should buy a travel guide from Lonely Planet, Frommer's, Rough Guides, Fodor's or another big publishing house. More travel related information: If you want more tips about how to easily print your maps, where to get on-line maps, where to stay, where to download ebooks with maps etc. then you absolutely must visit our Best Travel Tools page. There is a lot of great tools and links to many free sources of information. This project is not affiliated with or sponsored by WikiVoyage.